Very glad this is not the end of this series!! What I liked: There was an error on Goodreads that indicated this would be a trilogy. I think every one panicked, including me. The world Ms Wells has created in this series is certainly worthy and entertaining enough for more than three books! The previous book, Cursed Moon wasn't my favorite. I'm not sure which is harder for the writer, the first book or the second. So much to establish in the first entry but enough to keep the reader hooked and then following it up with another to lay the ground work for the series as a whole. Ms Wells is moving this series characters slowly forward but not without drama, character development and world building. I like the flow of Deadly Spells, it's at the perfect speed with a crescendo here and there. I'm still not exactly sure what Volos is up to and how his character is going to shake out (that's a good thing). I have no doubt he's not a very good guy but there seems to be more going on with him than we've been privy too so far. Kate had me a bit frustrated concerning her love life and feelings in this installment of the series. I couldn't get a good read on her and her expectations for her life until right at the end. Her actions at the end gave me a better feeling for her character and her actions. Of course there are a myriad of other characters and we finally get to know a bit more about Agent Gardner and how her life spun out of control. I really like her character as she seems to be grounded but a bit mysterious. What I didn't like: It wasn't so much about what I didn't like as more what frustrated me. Kate!! Back and forth with her emotions and her feelings. Yeah, I know, not a bit deal but I wanted her to "man up" a few times but it turned out okay....for now. Overall, a good solid read. 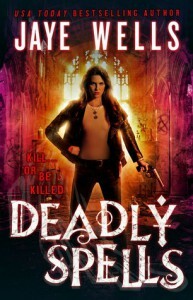 If you like Urban Fantasy and police procedurals, you'll really enjoy Deadly Spells! !